Santa Ponsa beach is the main beach of Santa Ponsa. Santa Ponsa beach is a great white sandy beach with warm and crystal clear waters. Lying on the white sandy beach of Santa Ponsa is one of the best things to do in Santa Ponsa for the holidaymakers. Santa Ponsa beach is 1300 meters long and 130 meters width with fine sand, warm and crystal clear waters. Santa Ponsa beach has been awarded the Blue Flag that means it adheres to the strict rules and standards. It has also been awarded the prestigious “Q” for European Quality. It also offers large safe swimming area. There is a flag system at the Santa Ponsa beach that when the red flag is flying, it means that „Do Not Swim“. Santa Ponsa beach is separated from the pine woods by the promenade. Holidaymakers may find all beach services at the Santa Ponsa beach. There lifeguards during summer from 10.00 am. to 06.00 pm. There is also a tourist office and first aid centre located along the promenade. Holidaymakers may find plenty of restaurants, sandwich and coffee bars to choose from at the main streets along the beach promenade. There are also three beach bars located just on the Santa Ponsa beach for the beachgoers. As for watersports; holidaymakers may also find all kinds of water sports activities at the Santa Ponsa beach such as water ski, jet ski, banana-riding, pedal boats and paragliding. In addition; holidaymakers may find and attend to boat trips that depart from the Santa Ponsa beach and from the port and enjoy the beautiful shores and sea along the south-west coast of Majorca. Most trips costs about 15-20 €. 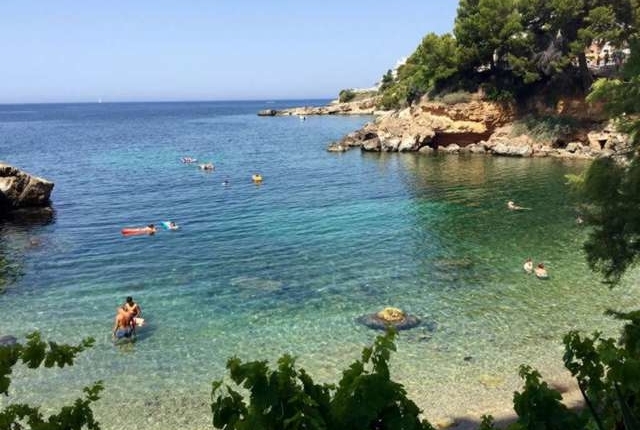 And for the ones who want to escape from the crowds at the Santa Ponsa beach, there is a small sandy cove and scheduled beach, Pellicer beach, also known as „Little Beach“ located just 15 minutes by walking, at Avda. Rei Jaume I to the port. With a length of over 1300 meters and an average width of about 100 meters, the main beach of Santa Ponsa is quite large and in recent years it has been expanded with imported sand to accommodate an increasing number of visitors to the resort. Nevertheless, it can still be very crowded in the main season due to its popularity with tourists and locals. However, if you want to escape from the crowd, there is also a smaller beach in its own sheltered bay, about 15 minutes‘ walk from the Avda. Rei Jaume I. Both beaches have the usual facilities expected of a modern resort. From May to October, sun loungers and parasols are provided daily. The caregivers will collect money from you shortly after occupying a bed. Also on the larger beach there are pedal boats to rent, along with a good selection of other water sports equipment. Swimming in the bay is usually fairly safe, with no strong currents, and fairly shallow water, but caution must always be exercised when the flag system is in operation. Although a safety area is roped for swimming, it is recommended that you do not swim outside this area. It is forbidden to use paddle boats, windsurfers, boats and jet skis in this area. If a lifeguard is present on the beach, all instructions given by him must be observed. Regular boat trips along the southwest coast are offered from both the main beach and the marina in Santa Ponsa and are excellent value for money with a price of around £ 10 a head. The boats are all quite modern, with a small bar and toilets on board. On most rides, the captain usually stops for 30 minutes, giving you the opportunity to dive or jump off the back of the boat and cool off in the sea. Illegal fruit vendors often parading up and down the beach during the summer months trying to sell pineapples, melons and more. They are very tempting, especially if you lie in the sun for hours, but beware – the fruit has often been exposed to the heat for a considerable time and the price you pay for a piece of melon – well, you could buy several melons, if you went to a local supermarket! The Little beach (Pellicer beach) is located 15 minutes by walking,at Avda. Rei Jaume I to the port, from the Santa Ponsa beach, on the south side. The Little beach is a scheduled beach located on a small cove on the way to Santa Ponsa Marina. It is popular for the holidaymakers who want to escape from the crowds at the Santa Ponsa beach and for Spanish families. There are not much facilities at the Little beach. Also no sunbeds for hiring. There is a children’s playground along the road nearby the beach which is perfect for the families with children. Also there is a mobile library rental service that offers wide range of books and daily newspapers. The Castellot beach (Playa des Castellot) is a small and rcky beach located on the north side of Santa Ponsa. Castellot beach is 45 meters long and 7 meters. The surface of the Castellot beach is covered with small pebbles and it is surrounded by a five meter high rock wall. There are not much facilities at the Castellot beach. Also no sunbeds for hiring. The nearest facilities such as restaurants, bars and shops are located about 100 meters from the beach at the Santa Ponsa town square.